Today we shopped at Walmart and Loblaws Superstore in Southern Ontario. 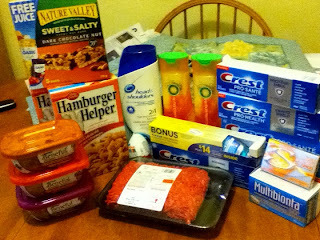 All of the food and products we bought, shown in the picture - total value of $68.31 - only cost us $20.60! How can you do this too?? Coupons were mostly online printables, in-store coupons, Save.ca, GoCoupons.ca and Websavers.ca. Read the Frugal-Freebies.com website and our Facebook fan page every day - I post all the coupons I find and use for everyone else to use too! And I have $17.89 in new coupons!